Filing for either Chapter 13 or Chapter 7 bankruptcy will cost you, lowering your credit score by 100 points or more. This will make qualifying for new credit cards, a mortgage loan, auto loan, or personal loan nearly impossible, at least for several years after you file. But that doesn't mean that filing for bankruptcy is never the right decision. "We look at bankruptcy as a last resort," said Leslie Tayne, a debt-relief attorney and founder of Tayne Law Group in Melville, New York. "But sometimes I do advise people to file for bankruptcy. When paying off debt would leave you with no money left over to put food on the table, if it means you can't pay your mortgage, if there is nothing left over, that's catastrophic, and then it makes sense to file for bankruptcy." But Tayne warns that filing for bankruptcy shouldn't be taken lightly. Doing so will damage your credit for up to 10 years. But if there are no other options? There are three times when filing for bankruptcy protection does make sense. Before you do file for protection, you need to know the consequences. There are two main types of bankruptcy protection that consumers can typically access: Chapter 13 and Chapter 7. In Chapter 7, you don't repay your debts under a payment plan. Instead, a bankruptcy judge handles the selling of your nonexempt assets to raise enough money to pay back at least some of your debts. Your home might be protected under Chapter 7 bankruptcy, but it's important to check with an attorney first. Under Chapter 13, a bankruptcy judge sets up a repayment plan. Under this plan, you pay back some or all of your debts, but at a rate — and with monthly payments — that you can afford. Both forms of bankruptcy will usually drop your credit score by 100 points or more. But Chapter 7 bankruptcy stays on your credit report for 10 years, while Chapter 13 falls off after seven. Lenders will see your bankruptcy filing every time you apply for a credit card, mortgage, car loan, student loan, or any other form of debt. You will struggle to get lenders to approve your applications — at least for the first several years after filing for bankruptcy protection — and will often have to pay higher interest rates when lenders do decide to loan you money. When, then, does taking this credit hit make sense? Tayne says that bankruptcy is often the best option when consumers owe so much that their liabilities are far higher than the value of their assets. In such cases, it can be nearly impossible for consumers to catch up with their debts. "If income is far less than expenses, if there is no end in sight even if I help them cut their expenses, then bankruptcy might be the only option," Tayne says. "If their income will never let them meet the requirements to pay even the minimal amount of what they owe each month? Then bankruptcy might be their only choice." Before filing for bankruptcy, you should always try to negotiate with your creditors. Many might be willing to reduce the amount of money you owe them if you can prove that you are struggling financially. To prove this, you might have to send your creditors copies of your most recent paycheck stubs and bank statements, anything that will prove that your income has fallen or that your savings are depleted. But if your creditors won't negotiate with you, you might have no other option but to file for bankruptcy protection. Once you do file, a bankruptcy trustee will take over the task of negotiating with the people you owe. These professional negotiators might have more success convincing creditors to forgive at least some of your debt. Often, people fall into financial troubles because of a catastrophic event, whether a job loss or a serious medical emergency. Bills and debt can pile up quickly when one of these setbacks slashes your ability to generate a monthly income. 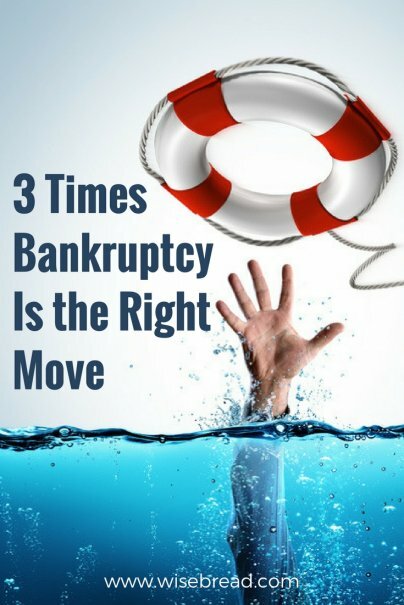 If a job loss, medical emergency, or other financial disaster has eliminated all or most of your monthly income, and you can't see any way to catch up on your mounting debt, filing for bankruptcy protection might provide you the relief you need on the way to bouncing back from your financial setbacks. Have you ever considered bankruptcy? A New Lender Took Over My Mortgage — Now What?